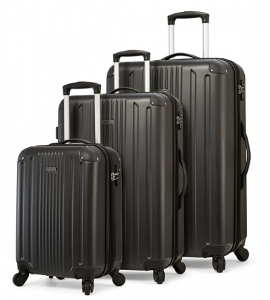 TravelCross Milano is a 2018 release modern and great quality luggage set of three lightweight yet robust suitcases with hardshell exteriors and easily rolling spinner wheels. You’ll find a 20-inch carry-on bag, a medium size 24-inch and a large 28-inch, all of which are expandable. You have a total of eight color options to choose from: Black, dark blue, dark gray, champagne, red, orange, purple and white. The hardshell exteriors are made of the sturdy yet lightweight ABS plastic that makes it resistant to impact and any adverse weather conditions. The spinner wheels can be rolled smoothly and without much effort. And you can move very quickly on different grounds, especially when you’re walking through the parking lots and airport grounds. All three bags have the super solid aluminum telescoping handles that you’ll hold when moving the bags and will fit in your hand nicely. They all come with the keyless combo locks that are TSA-compatible and are preset to 0-0-0 which you can change to the digits of your choice. You can certainly have a peace of mind for the security of your bags’ contents as only the TSA staff at the airport can open them without breaking them. To reset the lock, first, you need to have it in the first 0-0-0 position, press the tiny reset button with a pen till you hear a click and set the digits to something you shall remember easily. And you just press the tab on the side and you’ll hear another click. These suitcases have fairly spacious interiors and you can unzip the zippers in the middle to get even more space when you need it. 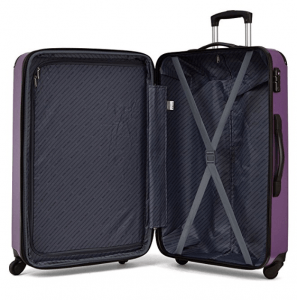 The 20” cabin bag weighs just 6.5 pounds and measures 20 x 14 x 8 inches without the wheels. This smallest 21” bag can be used as a cabin bag to be taken on the plane with you as it meets the IATA standards and you shall be fine on your flights both at home and abroad. It will fit the overhead bin above your very comfortably. The weight of the medium bag is just over 8 pounds and the dimensions are 24 x 16 x 10 inches. And the largest suitcase weighs 10.6 pounds and measures 28 x 19 x 12 inches. You’ll get these bags nested into each other with the smallest into the 24-inch bag and the medium into the large suitcase. And this is how you’ll probably want to store the bags when not in use and save on some space. You can expect a great deal of overall performance, reliability, functionality, features, and comfort by the bags’ ergonomic design during your travels. It seems like a very good value for money luggage set.